The most part of the songs in the list are instrumental, having no lyrics, like Lost Fur or Sailing Home. Every other song contains explicitly small quantity of it (like Animal) and have really unsophisticated matter of essence. The only real value of every music piece in the soundtrack is underlining the gloomy mood of the motion picture. While its creators have emphasized that it is totally suitable for kids viewing, most of the beholders have estimated it not too friendly, as it has collected only USD 100 millions, with the budget of USD 100 millions. The outward appearance of the most part of creatures, coming from the mind of a little boy, is really frightening. The first part of the movie you get used to them and the second part you spend, being bored from the uninteresting evolving of the storyline. 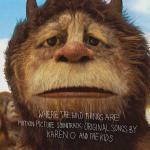 Karen O And The Kids has made the most part of the soundtrack, both instrumental and with lyrics, while the only performer besides of her in this collection is Carter Burwell. The critics said that this was confusing to most part of young beholders, as it contains a lot of grown-up thoughts of childhood, instead of depicting the childhood’s dreamland through the child’s reflection of things. Despite the film was made by Spike Jonze, sometimes it feels like it was shot by Alejandro G. Iñárritu, which perfectly coped with war-and-loneliness drama The Revenant with Leo DiCaprio in 2015. It raises so many issues of fear, loneliness, and unhappiness, as the person should not face in his adolescence. Whatever outcome of the film is, most of spectators were leaving the halls after watching the film with disappointment and frustration. Imagine how young spectators felt themselves after this picture? So there is nothing unthinkable that this collected nothing above its budget.